Chas Andres is a freelance writer and MFA student living in Wilmington, North Carolina. When he's not at his keyboard dreaming up stories, you can find him playing with his cats, listening to records, or building yet another Magic deck. Today's flavor fans have it made. Magic's story progresses every week on Uncharted Realms, where epic tales span thousands of years and dozens of planes. The pre-millennial era of Magic storytelling did give us two really compelling multi-block narratives, though. The first is the story of Gerrard Capashen and the crew of the Weatherlight versus the invading forces of Phyrexia. The second is The Brothers' War, an earlier tale where Urza and Mishra fought for control of Dominaria. Gerrard's struggle was revisited in 2010, when Wizards of the Coast released Duel Decks: Phyrexia vs. The Coalition. I've always wanted to see a duel deck focusing on The Brothers' War, too, but I doubt it will ever happen. Most of the cards depicting that conflict are from ancient sets and are underpowered by contemporary design standards. Here at My Favorite Flavor, we don't have that problem. 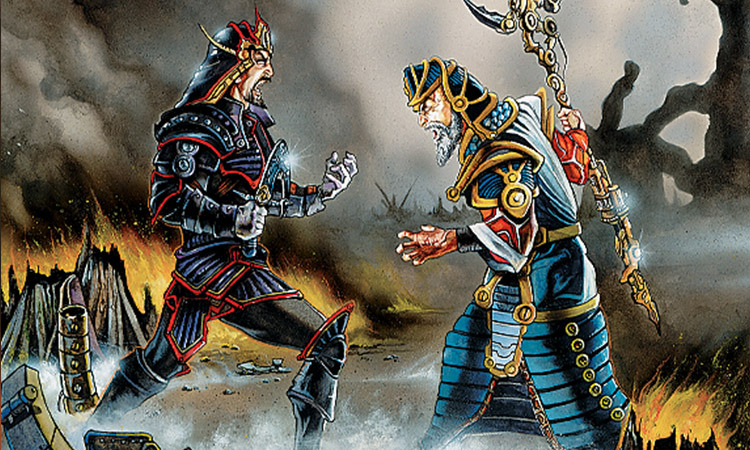 When the fine folks at Wizards of the Coast asked me to write this column, I knew that an Urza vs. Mishra duel deck would be one of my first tasks. Duel decks are great—they're fun, flavorful, and perfect for a quick game before Friday Night Magic or after dinner. I hope to build quite a few duel decks in this space over the next few years, but let's start with the one I've had my eye on the longest: Urza vs. Mishra. Our Urza deck is going to run four copies of each "Urzatron" land (the name given to this trio that, when assembled, allows three lands to produce seven mana). We'll have to run a lot of colorless spells as a consequence of this, but Urza is an artificer, after all. If you get all three Urzatron pieces in play at once alongside a copy of Urza's Factory, you can start churning out Assembly-Worker tokens just like Urza intended. Neat, eh? Even though Urza founded the Tolarian Academy and built Karn many years after the end of the war, they are among his most iconic achievements and belong in a deck attempting to chronicle his early adventures. Here's another small concession to Urza's later years. Early on, Urza's Rage can pick off problematic creatures. Late in the game, it can win out of nowhere. Both of these decks are relatively underpowered, so this is an incredibly potent weapon that shouldn't be deployed lightly. The Brothers' War decimated Dominaria and flattened the previously fertile island of Argoth. Much of the land that wasn't destroyed in combat was mined away for resources in support of the war effort. Both Urza and Mishra's decks contain Strip Mine in order to properly reflect this devastation. One of the most interesting aspects of The Brothers' War is that Urza and Mishra weren't independently responsible for most of their creations. The brothers were archeologists before they were artificers, and they were investigating the technology of the Thran—a culture of technologically advanced ancients whose achievements were lost to time. Many of Urza's successes involved recreating or co-opting Thran technology that he didn't fully understand. Urza was no stranger to magical trinkets. Urza's Bauble is just that, but the Mightstone has a much deeper significance. It's Urza's half of the Thran powerstone tasked with keeping the Phyrexian portal inside the Caves of Koilos shut. When Urza and Mishra came across the portal, the stone shattered and they each ended up with half. Both brothers coveted each other's artifact, and that conflict was the inciting incident that lead to a continent-spanning war. The iconic Ornithopter is Urza's most memorable invention. While we won't have any equipment to give this guy before sending it into battle, it's a decent early blocker that plays well with an active Mightstone. Why did Urza have a pope hat with flowers on it? I don't remember this ever coming up in the books. I really hope he wore it with his sunglasses while strutting around Dominaria like he owned the place. At any rate, both of these cards help turn even our worst artifacts into live draws. Urza became the Chief Artificer of Yotia, and it was his base of operations during the first years of the war. Yotian Soldiers made up a large portion of his fighting force, so they belong here as well. Both of these creatures were created for Urza's army by Tawnos, his trusted second in command. Clay Statues were considered to be among Tawnos's most powerful and fearsome creations, but I prefer the Triskelions myself. I like to think that he was inspired by the Daleks during a Doctor Who marathon on BBC Dominaria. We have to take advantage of our Mightstone somehow, and there aren't a lot of artifact token makers from The Brothers' War era of Magic. Tetravus is a four-for-one that can be cast fairly easily with the Urzatron lands, making it one of the better cards in the deck. Mind Over Matter showcases my favorite visual depiction of Urza. While it is most often used as part of an infinite combo, in this deck is can allow you to deal with an opponent's most troublesome attacker or tap down their army and swing in for the win. You'll probably need to have Tolarian Academy in play if you actually want to cast it, though. Opposition is another great way to win the game, allowing you to use your Ornithopters and Tetravites to tap down your opponents' blockers—or even their lands. This unassuming piece of pottery is the doomsday weapon that Urza unleashed to end the war, flattening both armies and giving him his Planeswalker spark. It did so much damage to the atmosphere that it helped cause the ice age that we all remember from, well, Ice Age. Even though Golgothian Sylex is a very silly card from a mechanical perspective, there are quite a lot of cards from Antiquities in both of these decks, so it's far from useless. I love that the Urza deck ended up with a blue-red color identity and this one is going to be blue-black-red. It shows the brothers' divergent paths as Mishra is slowly corrupted by Phyrexian influences. I'd say that Urza is partially white-aligned (Jeskai-colored) by the start of Invasion, but I see him as pure blue-red during The Brothers' War. These are the siege engines most closely associated with Mishra. Yeah, I wish they were more powerful, too. I remember reading about how fearsome the Dragon Engines were in the novels . . . and then finding one in a friend's collection and realizing it was just a 1/3. Womp womp. Urza's deck is more explosive than Mishra's, but Mishra's is more focused and has the better robots. Su-Chi is one of the most efficient cards in either general's army, even if it is (according to the flavor text, at least) a flawed copy of Thran technology. Weakstone is Mishra's half of the fabled Thran powerstone from the Caves of Koilos. Somehow, it's even worse than the half that Urza got. That's probably why he let this toothy rat-lizard hold onto it for safe-keeping. I was more sympathetic to Urza's side during The Brothers' War, because he was the one who wasn't being corrupted by the Phyrexians. You have to love Mishra's design aesthetic, though. His factory, at least on the Antiquities versions of the card, is jolly enough to make year-round use of a hot air balloon. His Ankh, at least in the Fifth and Sixth Edition versions, is some kind of weirdo cow skull with a windmill on top. The man's sense of flair is undeniable. One of the themes that plays throughout both sides of this duel deck is a very real sense of the land itself being under attack. Urza can take your mana away with Strip Mine, Opposition, and Mind Over Matter. Mishra attacks the land with Strip Mine and Mishra's Helix. He can also punish you with his Ankh for trying to reclaim more territory. Combine this with the fact that both sides have excellent utility lands and you can see why The Brothers' War was so hard on Dominaria. There's nothing in this deck that costs white mana, making Caves of Koilos worse than a basic Swamp. The card is important from a story perspective, though, because it's a place where a terminally-ill Mishra returned in search of healing, only to become corrupted by the forces of Phyrexia. It makes sense that Mishra would have to take pain without gain from this particular land. This is the portal that Mishra took to Phyrexia, sealing his fate along with that of many innocent Dominarians over the next several generations. It's also an absolutely devastating card in this duel deck match-up. Mishra's most trusted advisor, Ashnod, was a bit of a mad scientist. Neither her nor Mishra were above spilling a little human life in order to improve the efficiency of the war effort. Makes you wonder what that little balloon on the side of Mishra's Factory was actually for, doesn't it? Gix was a Phyrexian demon who played both sides in The Brothers' War in order to throw Dominaria further into chaos. Mishra was more susceptible to the Phyrexians' siren call, so the Gix-related stuff ends up in his deck. This endoskeleton was given to a very ill Mishra on Phyrexia, resulting in his complete fall into darkness. I'm putting two copies of it in this deck, so you can use Mishra, Artificer Prodigy to get a second Endoskeleton for a favored robot pal once you play the first one (and use it on Mishra himself, obviously). If Urza feels guilty about the tragic end of the war, Mishra's deck gets to benefit from it, right? I think so, too. I hope you enjoyed this look into Magic's distant past. If you put these decks together and try them out, email me your best gameplay stories at candres@gmail.com. Otherwise, I'd love to hear what custom duel deck you'd like to make. I might even take on your suggestion in a future article!